This post contains spoilers for this week’s episode of The Office. Read at your own risk. Remember on “Lost” when they met The Others? Every week I wait in giddy anticipation for a new episode of The Office. But this week is going to be a little different. See I’ve managed to snag an advanced screener of this week’s supersized ep, “The Merger”. Don’t get me wrong, I will still be looking forward to Thursday, but mostly because I can’t wait to talk to all of you about the episode. It’s a good one, dare I say perhaps one of the best ever. 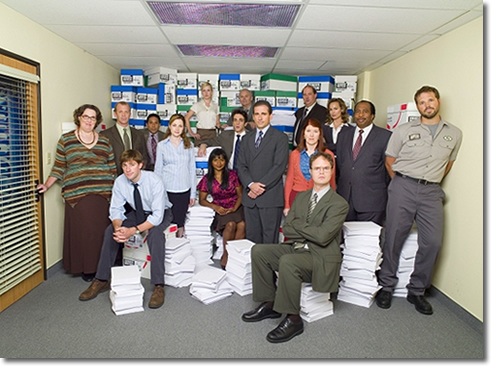 “The Merger” is JAM packed with everything we love about The Office. This week’s episode focuses on the merger of the Stamford and Scranton branches of Dunder Mifflin. Michael Scott is overly excited about the new people joining the branch. Of course it has less to do with building Dunder Mifflin than it does with the fact that Michael will have a fresh new audience for his antics, and perhaps a few new friends. Michael pulls out all the stops to properly welcome the new Stamford employees. Gift bags, a breakfast buffet, and even one of his signature homemade movies…Great Scott!! But despite his efforts (or rather because of) the new and old employees aren’t coming together as harmoniously as Michael had hoped. “The word merger comes from the word marriage and that was what today was supposed to be – the loving union between people,” Scott says. “Instead it has been like when my mom moved in with Jeff, and once again, it’s my job to fix it.” And let’s just say we all know the potential for disaster when Michael tries to fix a problem. The merging of Stamford and Scranton also means that fans get what they finally have been waiting for all season – two people in the same room, at the same time, for the very first time this season. From the moment they locked eyes the swell of emotion emanated from the screen. It was electric. And it most definitely laid the ground work for perhaps one of the best triangles in the history of television. Yes, in this week’s episode Andy and Dwight meet for the first time. The Assistant Regional Manager (Dwight) and the Regional Director of Sales (Andy) waste no time in trying to establish just who is going to be Michael Scott’s #2 guy. Dwight’s old tactics of sucking up might not hold up against Andy’s devious charms. Andy Bernard knows how to win people’s affections, and perhaps Dwight’s relationship with Michael isn’t his only relationship in jeopardy. Their interplay is genius and had me in tears. I suppose a few of you out there may be interested in the “other” reunion this week – that of Jim and Pam. Let me first just say that it was a beautiful thing watching Jim Halpert walk through the front door of the Scranton office. It’s so good to have him back where he belongs. And I’m not the only one who thinks so. Pam is elated to have her “friend” back, and he seems equally excited to see her as well. Not to say that there isn’t more than a hint of awkwardness in their exchanges. There are many things that have yet to be said, and the tension, be it sexual or otherwise, is palpable. But just seeing Jim and Pam on screen together made me feel that all is right with the world. Lest we not forget that the merger also brings the presence of one Ms. Karen Filipelli. A woman who is bound to have an impact on Jim and Pam’s relationship, right?. But what is really going on with Karen and Jim? Pam isn’t quite sure, but she is definitely picking up a vibe, and it definitely takes the air of of her big reunion with Jim. Did Pam blow it completely when she let Jim walk away all those months ago? We’ll see. I want to be careful not to give away any big spoilers, but I will give you this – the Dunder Mifflin parking lot is once again the backdrop to an important revelation that impacts Jim and Pam’s future. Ok, ok I feel like I am just being cruel now so I’m going to wrap it up. I can’t wait to hear from all of you during and after the show on Thursday. I know you all are going to love it as much as I did. A note of warning…have some tissues handy – seriously, I was laughing so hard I could hardly see the screen through the tears. Two words for you: (1) Lazy, (2) Scranton. You’ll know what I mean. ughh!!! LUCKY! i’m so glad it’s wednesday….only one more day! GMMR! You are so cruel to us. So many clues, but no answers. I can’t wait until tomorrow! And I’ll absolutely be refreshing for those yahoo clips alot today! Dunder Mifflin parking lot is once again the backdrop to an important revelation that impacts Jim and Pam’s future. Thanks for the review… I’m waiting on pins and needles until Thursday night!!!! I just hope they don’t give us tooo much JAM angst!!!! I don’t post on the other websites, I don’t even know how to. So here is the only place I know how to tell you of this if you didn’t know already and want to get the word out. John Krasinski made People’s sexiest men alive issue. There is a picture of him on their website. Click on the photo of George Clooney and John is #9 on their site. I wasn’t sure if you knew or if I could put the link here. Wow. Is it Thursday yet? I don’t think I can stand it!!! What happens in the parking lot?!?! So are you saying that I need to drop some Hamiltons at Magnolia to prep for this ep? Oh my gaaaaaaaaaaaad!!! I’m dying! Thanks for sharing (I think 🙂 ). They’re trying to kill me, I swear they are. I’ll have my tissues ready and a defibrilator just in case. Cheryl, I saw that John K made People’s Sexiest List also. When I was scrolling through the photos and saw his, I gasped. Big sigh. Can’t wait for Thursday’s show! Okay, all I am going to say is that if something happens to ruin it for my JAM addiction, I am going to stop watching, because this angst right now is killing me. I do not have the strength the be strung along for an entire season waiting for the writers to get their heads on straight and do something that is going to give some of us some freakin’ hope. Yes, bitter, I am bitter. And if Jim and Karen hook up, I will go to NBC and write for them!!!!! Just one question … is it Thursday yet??? Oh, I’m so excited for this episode! I’m hesitant that it may all be good news for “JAM” and their fans, but just the idea of them in the same office … once again … finally has me positively giddy! Thanks for the sneak peek, GMMR! I have to be honest: the part I was most anticipating was Dwight and Andy meeting each other (and I was a little nervous that I haven’t seen Andy in any of the previews). I’m glad to here they don’t disappoint! I’m sorry to say that there is no doubt in my mind that Karen and Jim will hook up, at least temporarily. Strangely, I’m okay with that. TEMPORARILY. Ok you’ve managed to tell us everything, yet nothing at all!! I don’t know whether that makes me happy or extremely pissed…Ok..somewhere in between….Wednesday has begun to be the worst day of the week. The anticipation is going to kill me, seriously I don’t think I can wait another 27 hours and 32 minutes…But I’ll try…..
Aww, thanks, GMMR…I’m so excited! And congrats on having Jenna mention you in her blog AND post a comment! Whee!